While most Americans say last week’s Supreme Court hearings on the 2010 health care law did not change their views of the law or of the Court, they did more harm than good to the image of both. 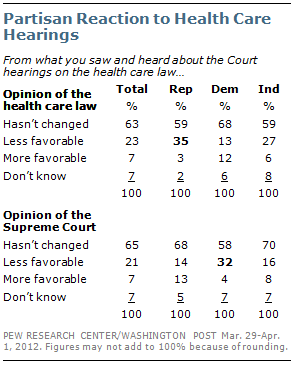 In the latest national survey by the Pew Research Center for the People & the Press and The Washington Post, conducted March 29-April 1, 2012 among 1,000 adults, nearly two-thirds (63%) say what they saw and heard about the hearings did not change their opinion of the health care law, while 23% say they now have a less favorable opinion and just 7% a more favorable opinion of it. Similarly, 65% say their view of the Supreme Court remains unchanged after the hearings, but the number who say their view of the Court has grown more negative is three times the number who say it has grown more positive (21% vs. 7%). These more critical reactions have a decidedly partisan cast. Roughly a third (35%) of Republicans say they have a less favorable opinion of the 2010 health care law after the hearings, compared with just 13% of Democrats. The pattern is reversed when it comes to the Supreme Court itself, with 32% of Democrats saying they now view the Court less favorably, compared with just 14% of Republicans.